Flying on French bee makes one feel like they are on holiday from the moment that they book. Open their website and you will see a bright, cheery, colorful, and informative presentation about their service and their beautiful destinations. The destinations from their home base at Paris-Orly are all primarily leisure spots. French bee started operations on 10 September 2016 as French blue with flights between Paris-Orly and Punta Cana in the Dominican Republic. Flights to Saint Denis, Reunion Island in the Indian Ocean were added in 2017. Flights to San Francisco and Tahiti were added in 2018. The name French blue evolved into French bee in January 2018 due to concern of similarity with the name of the US airline JetBlue. A historical note of importance is that French bee is the creation of the Jean-Paul Dubreuil company Groupe Dubreuil. Groupe Dubreuil is a French conglomerate diversified with the ownership of companies managing distribution of automobiles, distribution of farm equipment, providing energy, managing hotels, and operating airlines. It created the sister airline of French bee, Air Caraïbes. Air Caraïbes is also a leisure airline flying to holiday places featuring sun, sand, and beautiful waters. Its primarily focus is Paris to the Caribbean. Sun filled holiday destinations are the focus for operations from the airline’s main base at Paris Orly. Punta Cana, Reunion Island, San Francisco, and Tahiti are currently on the route map. 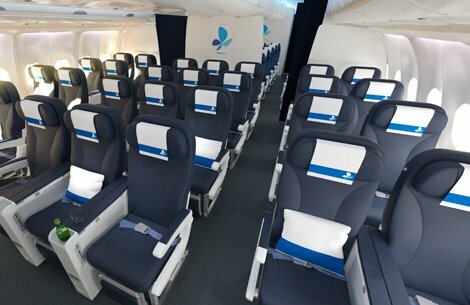 The airline selected an Airbus A330-300 configured with 28 Premium Class recliner-style seats and 350 Economy Class standard seats to commence operations. In 2018, French bee added two Airbus A350-900 configured with 35 Premium Class seats and 375 Economy Class seats to handle expanded services. Aircraft are painted white with calming shades of blue representing the beautiful waters of tropical seaside holiday destinations. Additional aircraft will be added as additional destinations are added. Basic – Includes the lowest fare, one piece of hand/carry-on baggage, no pieces of checked baggage, no meal included, no changes to tickets allowed, and tickets are non-refundable. Fees are charged for seat selection, checked baggage, meals, snacks, beverages, comfort kits, line jumping, priority boarding, and priority baggage handling. Smart – Includes one piece of hand/carry-on baggage, one piece of checked baggage, meals , a comfort kit, tickets may be changed with fees, and tickets are non-refundable. Fees are charged for seat selection, a second checked bag, comfort kits, line jumping, priority boarding, and priority baggage handling. 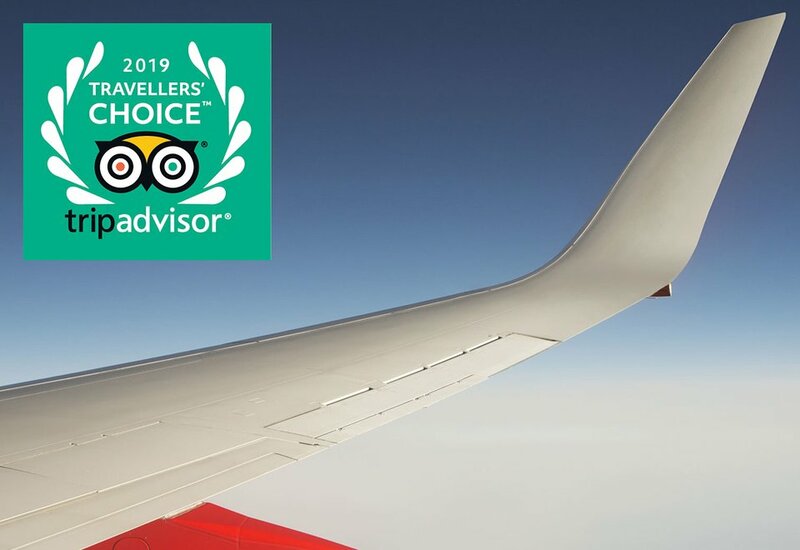 Premium – Includes comfortable seating selection in Premium Class at no fee, one piece of hand/carry-on baggage, two pieces of checked baggage, meals, snacks, champagne, wine, comfort kits, tickets may be changed with fees, and tickets may be refunded with fees. As noted, the Premium fare includes most available amenities. French bee has also organized several “Service Packs” that may be added to make the journey exciting and enjoyable. Examples include the Duo Pack which, added to the Basic or Smart selection, provides side-by-side seats, two glasses of champagne, and petits fours for an added snack or dessert. 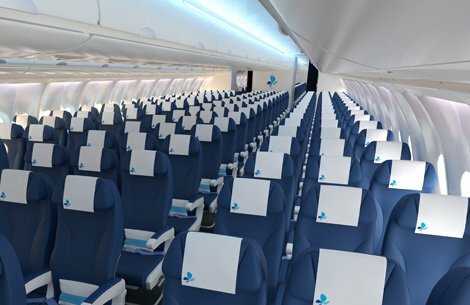 French bee’s aircraft are configured with high density seating in two cabins. The interior design features leather clad seats in cheery shades of blue with striking white side walls. Each seat features a wide, touch-screen, high definition inflight entertainment monitor, an AC power outlet, and a USB port to help while away the time on lengthy flights. Seats in Economy Class were designed with ergonomics for long-haul travel in mind featuring lumbar support, four position adjustable headrests, and a minimum of 81 centimeters/32 inches of seat pitch. Premium Class seats were designed with increased comfort in mind featuring generous width, generous recline, four position adjustable headrests, a leg rest, a minimum of 92 centimeters/36 inches of seat pitch, a center console with cup holder, and are arranged in a private cabin. Wi-Fi internet access is available to all. Four packages, each offering a designated length of time, are available for purchase. 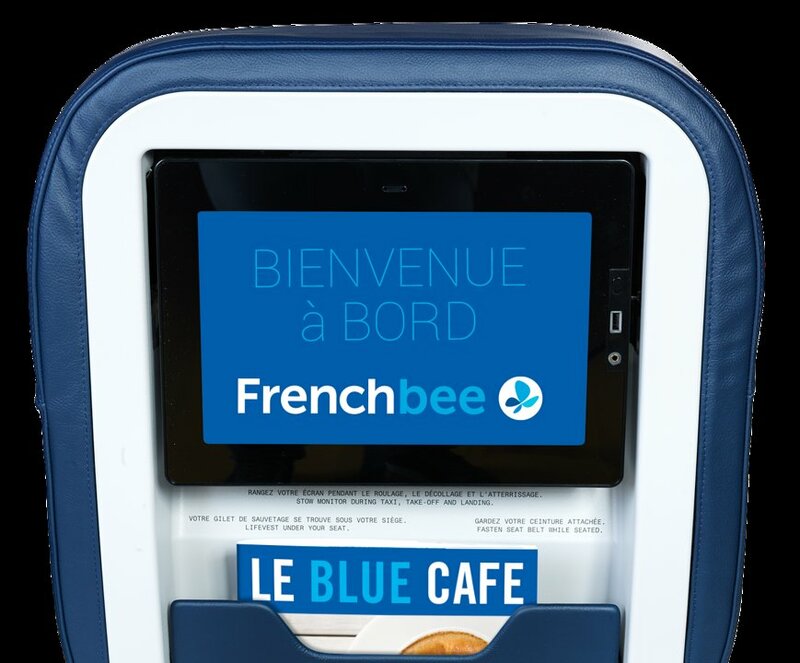 French bee is a product set up for low-cost leisure travel. It is a good model – fly to beautiful holiday destinations, charge base fares, and make passengers purchase add-ons for comfort during the journey. It has a good company backing it. It has beautifully painted planes. As the airline adds additional beautiful destinations, then the French bee experience will open-up to additional travelers. French bee is now presented on our SeatGuru.com website. Click here to access.